I love the colors of fall. 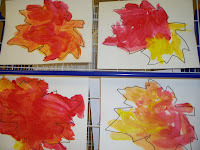 Our first activity at school for fall is to paint a fall leaf. We use the colors of red and yellow as these are the first two colors we have discussed. Also, because our next color is orange and it helps to incorporate the mixing of two colors to get another color. I love these fall leaves. It 's great to have them, because each one is so unique. We hang them around the room and it just adds so much life and beauty to the area. If you're making them at home it's great too, because your children can make as many as they like, and each one will be different. If you would like, you can even work for an end product being a big tree. 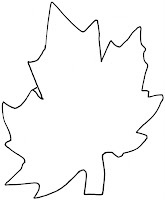 When I make the leaves I use a Maple leaf pattern, only because that's my favorite. If you would like, you can make different leaf patterns too. Then I have red and yellow paint out. I give the children the pattern I have pre-drawn and let them go. As I said, after they dry we cut them out and hang them in the room. 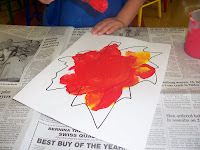 A variation to using tempera paint would be to use finger paint. We try finger paint later in the year when the children are more accustomed to their surroundings. 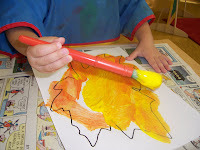 It's a great and easy fall activity that just adds so much color and vibrancy, but also secretly teaches that yellow and red make orange when mixed. 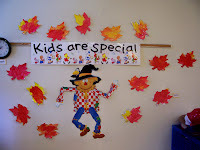 I have two updates: Number one, I wanted to post a pictures of our beautiful fall wall! Second, I have been getting many search requests for leaf patterns. I have been out on the net, looking for good ones, but haven't come up with any good large ones. I thought I would scan mine in and post it. If you click on the picture it should come up, then you can print it out(I hope). I'm still learning a lot of this stuff. Beautiful creations!! My daughter's preschool teacher asked me to come in and read and do a craft. I chose fall leaves. The kids are going to decorate their leaves with small peices of felt and tissue paper. (fall colors) I spent the evening cutting out leaves and little squares of felt for tomorrow's lesson! Have a great night! I found free clip art at www.carson-dellosa.com. I love the smile faces they put in their clip art.